Researchers in the Novartis-sponsored FLUID study evaluated whether individuals with neovascular age-related macular degeneration who tolerated some subretinal fluid in treatment with ranibizumab using a treat-and-extend regimen could achieve similar visual acuity outcomes as treatment aimed at resolving all their SRF. The multicenter, randomized, 24-month, Phase IV, single-masked, noninferiority clinical trial included subjects presenting with treatment-naive nAMD. Subjects with active subfoveal choroidal neovascularization were randomized to receive ranibizumab 0.5 mg monthly until complete resolution of SRF and intraretinal fluid (intensive arm: SRF intolerant) or resolution of all IRF only (relaxed arm: SRF tolerant except for SRF >200 μm at the foveal center) before extending treatment intervals. A five-letter noninferiority margin was applied to the primary outcome measure. Main outcome measures included mean changes in best-corrected visual acuity and central subfield thickness, and number of ranibizumab injections from baseline to month 24. Of 349 subjects randomized, 279 (79.9 percent) completed the 24-month visit. The mean change in BCVA from baseline to month 24 was 3 ±16.3 letters in the intensive group and 2.6 ±16.3 letters in the relaxed group, demonstrating noninferiority of the relaxed treatment to the intensive treatment (p=0.99). Similar proportions of the intensive (53.5 percent) and relaxed (56.6 percent) groups achieved ≥20/40 VA; p=0.92 and ≤20/200 VA (intensive: 8.7 percent; and relaxed; 8.1 percent; p=0.52). • Results were supported by the per-protocol analysis and adjustment for confounding baseline factors. • Subjects in the relaxed group received fewer ranibizumab injections over 24 months (mean: 15.8 ±5.9 injections) than those in the intensive group (17 ±6.5; p=0.001). • Significantly more subjects in the intensive group never extended beyond four-week treatment intervals (13.5 percent) than in the relaxed group (2.8 percent; p=0.003). • Significantly more subjects in the relaxed group extended to and maintained 12 weekly treatment intervals (29.6 percent) than the intensive group (15 percent; p=0.005). Researchers determined that individuals treated with a ranibizumab T&E protocol that tolerated some SRF achieved comparable VA (with fewer injections) to that achieved when treatment aimed to completely resolve all SRF. SOURCE: Guymer RH, Markey CM, McAllister IL, et al. Tolerating subretinal fluid in neovascular age-related macular degeneration treated with ranibizumab using a treat and extend regimen: FLUID study 24 month results. Ophthalmology 2018; Nov 28. [Epub ahead of print]. Investigators wrote that macular atrophy and scarring increase in prevalence during treatment for neovascular age-related macular degeneration and are associated with poor visual acuity. They sought to identify the distribution of spectral-domain optical coherence tomography-determined features and subretinal lesion thicknesses at sites of macular scar or atrophy after two years of treatment in the Comparison of AMD Treatments Trials, as part of a cross-sectional analysis of CATT participants with SDOCT, color photograph and fluorescein angiogram (CP/FA) images at year two. Sixty-eight study eyes at year two in CATT were selected based on image quality and CP/FA-determined predominant presence of: geographic atrophy (GA, n=25); non-GA (NGA, n=44); fibrotic scar (FS, n=26); or non-FS (NFS, n=7). CP/FA components were delineated by CP/FA readers; SD-OCT morphologic features and thicknesses were delineated by OCT readers. Using custom software and graphic user interfaces, investigators registered images, overlaying features and components per pixel and analyzed differences across groups. Main outcome measures included OCT features, CP/FA components, and retinal and subretinal lesion thicknesses at each pixel of regional overlays. •	SD-OCT assessment of registered areas of pathology revealed the following: 1) retinal pigment epithelium atrophy (with or without residual lesion material) covered 75 percent of pixels designated as GA, 22 percent as NGA, 24 percent of NFS and 46 percent of FS (p<0.001); 2) photoreceptor layer thinning covered 85 percent of GA, 42 percent of NGA, 33 percent of NFS and 59 percent of FS (p<0.001); 3) subretinal lesion features covered 31 percent of GA, 42 percent of NGA, 85 percent of NFS and 92 percent of FS (p<0.001). •	Mean thickness of the subretinal lesion complex (microns ±standard deviation) differed between GA (48 ±25), NGA (61 ±35), NFS (83 ±17) and FS (151 ±74) (p<0.001). •	In eyes with GA the thickness was greater in areas with residual lesion (51.4 ±27) than in those without (27.2 ±9). Investigators concluded that RPE atrophy and photoreceptor layer thinning were common in areas of macular atrophy and fibrotic scars. They added that photoreceptor loss extended beyond the areas of clinically apparent atrophy and fibrotic scar, and subretinal lesion components were common in areas of scars and were also present in nearly one-third or more of areas of macular atrophy. SOURCE: Toth CA, Tai V, Pistilli M, et al. Distribution of OCT features within areas of macular atrophy or scar after two years of anti-VEGF treatment for neovascular AMD in CATT. Ophthalmology Retina 2018; Dec. 3. [Epub ahead of print]. The status of age-related macular degeneration in the fellow eye has been used as an indicator of the GA progression rates in the primary eye, but reported growth rates vary widely in prior clinical studies. Scientists conducted a systematic review and meta-analysis of how fellow-eye status predicted the progression rate of geographic atrophy. The searched Medline, Embase, Cochrane Library, Clinicaltrials.gov and PubMed for studies that classified treatment-naïve GA patients based on different AMD manifestations in the fellow eyes and monitored GA progression in the primary eyes. Three fellow eye statuses were analyzed: (1) FE-None (no GA or choroidal neovascularization in the fellow eye), (2) FE-GA (GA in the fellow eye) and (3) FE-CNV (CNV in the fellow eye). To account for the different entry times, scientists introduced a horizontal translation factor to shift each data set within each group. They determined the translation factor by adjusting it one month at a time until the r2 in weighted least squares regression (r2WLS) was maximized for the cumulative linear trend line of all data sets. Heterogeneity and study quality were assessed using I2 statistic and Newcastle Ottawa Scale. Publication bias was evaluated by funnel plots, the Egger test, and the Begg test. Scientists included nine studies with 2,134 eyes from 1,835 patients. •	After the introduction of translation factors, the data sets in each fellow-eye group fit along a straight line with a high r2WLS. •	The GA radius growth rate in FE-GA (0.179 ±0.003 mm/year) and FE-CNV (0.159 ±0.015 mm/year) was significantly higher than that in FE-None (0.110 ±0.009 mm/year) (p<0.001 and p=0.02, respectively). •	No significant difference was found in the GA radius growth rates between FE-GA and FE-CNV (p=0.42). Scientists confirmed that the presence of advanced AMD in the fellow eye, defined as GA or CNV, could serve as biomarkers of the GA enlargement rate in primary eyes. They suggested that might assist the design of clinical trials and shed light on the natural history of GA expansion. SOURCE: Shen LL, Liu F, Grossetta Nardini HK, et al. Fellow eye status is a biomarker for the progression rate of geographic atrophy: a systematic review and meta-analysis. Opthalmology Retina 2018; Dec 7. [Epub ahead of print]. Researchers studied the correlation between optical coherence tomographic findings and focal macular electroretinograms at 12 months after intravitreal injections of ranibizumab in eyes with age-related macular degeneration, as part of a prospective clinical study. They evaluated 28 eyes of 28 individuals with AMD treated with ranibizumab at monthly intervals for three months. Additional injections were given per a pro re nata regimen. OCT and fmERGs were performed preoperatively, and at three and 12 months postoperatively. The fmERGs were elicited by a 15-degree white stimulus spot centered on the fovea. The thickness of the inner, middle and outer layers of the retina, and of the serous retinal detachment and pigment epithelial detachment in the horizontal and vertical meridians at 1.2 mm from the fovea were measured. • The b-wave amplitude at 12 months was significantly correlated with the thicknesses of the outer retinal layer, SRD and PED (p=0.001 to 0.02). • Multiple regression analyses showed that the outer retinal layer thickness was an independent determinant (p=0.0001). • Changes in the b-wave amplitude between baseline and 12 months were significantly correlated with changes in the SRD thickness (p=0.006). • The changes in the b-wave amplitude during the PRN period were significantly correlated with changes in the PED thickness (p=0.02). Researchers found that the reduction in SRD thickness affected macular function recovery 12 months after treatment initiation. They wrote that, as recurrences of the PED could occur during the PRN period, control of the PED would be necessary to obtain good macular function for the long term. SOURCE: Nishimura T, Machida S, et al. Correlation between macular structure and function in patients with age-related macular degeneration treated with intravitreal ranibizumab: 12-month-results. Jpn J Ophthalmol 2018; Nov 23. [Epub ahead of print]. Researchers evaluated durability of diabetic retinopathy improvements after a change in ranibizumab dosing from monthly to customized pro re nata therapy. They employed a pooled analysis of the open-label extension (OLE) of RIDE/RISE study subjects with DR and diabetic macular edema. RIDE and RISE were sponsored by Genentech, and three of the study investigators are employed by the company. In the RIDE/RISE studies, subjects (n=759) were randomized 1:1:1 to ranibizumab 0.3 mg monthly, 0.5 mg monthly or monthly sham injections with rescue macular laser available after six months. After 24 months, sham subjects crossed over to ranibizumab 0.5 mg monthly. After 36 months in the core studies, subjects in the OLE (n=500) could receive ranibizumab 0.5 mg through an individualized PRN dosing regimen based on predefined DME retreatment criteria. DR severity was evaluated photographically using the Early Treatment Diabetic Retinopathy Study DR severity scale. The main outcome measure included the change in DR severity from months 36 to 48 by retreatment status. •	Among subjects who entered the OLE, 121/500 (24 percent) didn’t require additional ranibizumab injections. •	In total, 442 subjects had evaluable DR outcomes during the OLE; 367 had evaluable DR at months 36 and 48. •	Among subjects not requiring ranibizumab retreatment from months 36 to 48 (88/367): 57 to 78 percent experienced DR severity stability, 0 to 7 percent experienced ≥2-step improvements, and 22 to 36 percent experienced ≥2-step worsening. •	Among subjects requiring ranibizumab retreatment (279/367): 84 to 94 percent experienced DR severity stability, 2 percent experienced ≥2-step improvements, and 3 to 14 percent experienced ≥2-step worsening. •	On average, vision improvements were maintained during the OLE regardless of change in DR severity. DR severity improvements with ranibizumab were maintained in the majority of subjects in the OLE after switching from ranibizumab monthly to an individualized ranibizumab 0.5 mg PRN dosing regimen (using best-corrected visual acuity and optical coherence tomography to evaluate). Researchers wrote that, because nearly one-third of OLE subjects not requiring further therapy for DME experienced DR worsening, they recommended that individuals be watched carefully once DME resolves for DR worsening and need for more frequent follow-up or treatment with anti-VEGF or other modalities. SOURCE: Sun JK, Wang PW, Taylor S, et al. Durability of diabetic retinopathy improvement with as-needed ranibizumab: Open-label extension of RIDE and RISE studies. Ophthalmology 2018; Nov 9. [Epub ahead of print]. Researchers compared widefield swept-source optical coherence tomography angiography with ultra widefield fluorescein angiography for evaluating neovascularization before and after panretinal photocoagulation in eyes with treatment-naive proliferative diabetic retinopathy, as part of a prospective, observational, consecutive case series. The study was partially funded by Carl Zeiss Meditec (maker of the SS-OCT device used in the study), two of the authors receive funding from CZM, and one of the authors co-owns a patent that’s licensed to CZM. Individuals with treatment-naive PDR were imaged using the SS-OCTA 12x12mm field of view (PLEX Elite 9000; Carl Zeiss Meditec) at baseline and at one week, one month and three months after PRP. Select eyes were imaged with five SS-OCTA 12x12mm scans to create posterior pole montages. UWF fundus photography and UWF FA were obtained at baseline and three months after PRP. Main outcome measures included NV visualized using widefield SS-OCTA and UWF FA. From January through May 2018, wide field SS-OCTA was performed on 20 eyes with treatment-naive PDR from 15 individuals. •	The en face SS-OCTA 12x12mm vitreoretinal interface slab images showed NV at baseline in 18 of 20 eyes (90 percent). •	Of the remaining two eyes, the posterior pole montage captured peripheral NV in one eye, and in the other eye, no evidence of NV was detected with either UWF FA or SS-OCTA. •	After PRP, both SS-OCTA and FA demonstrated similar progression or regression of NV, but SS-OCTA provided more detailed visualization of the vascular changes. Researchers wrote that NV in PDR could be identified at baseline and imaged serially after PRP using widefield SS-OCTA. They added that, in individuals with a high clinical suspicion for PDR, widefield SS-OCTA will likely be the only imaging modality needed for diagnosis and longitudinal evaluation of NV. SOURCE: Russell JF, Shi Y, Hinkle JW, MD, et al. Longitudinal wide field swept source OCT angiography of neovascularization in proliferative diabetic retinopathy after panretinal photocoagulation. Ophthalmology Retina 2018; Nov. 23. [Epub ahead of print]. Scientists aimed to understand the impact of deep learning diabetic retinopathy algorithms on physician readers in computer-assisted settings, as part of an evaluation of diagnostic technology, They reviewed 1,796 retinal fundus images from 1,612 diabetic cases. A total of 10 ophthalmologists (five general ophthalmologists, four retina specialists, one retina fellow) read images for DR severity based on the International Clinical Diabetic Retinopathy disease severity scale in one of three conditions: Unassisted, Grades Only, or Grades + Heatmap. For Grades Only assistance, scientists created a histogram of DR predictions from a trained deep-learning model. For Grades + Heatmap, they additionally showed explanatory heatmaps. • Readers graded more accurately with model assistance than without for the Grades Only condition (p<0.001). • Grades + Heatmaps improved accuracy for cases with DR (p<0.001), but reduced accuracy for cases without DR (p=0.006). • Model assistance increased the accuracy of retina specialists beyond that of the unassisted reader or model alone. • Model assistance increased grading confidence and time on task. For most cases, Grades + Heatmap was only as effective as Grades Only. • Over the course of the experiment, time on task decreased across all conditions, although most sharply for Grades + Heatmap. Researchers developed a new clinical ultrahigh-resolution spectral-domain optical coherence tomography system using an original averaging algorithm they call A-scan matching. The aim of this study was to determine whether the system could obtain clearer sectional images of the retina than conventional standard-resolution SD-OCT systems. Two of the authors received honoraria and/or financial support from the maker of the A-scan matching OCT device, Kowa. Investigators recorded horizontal B-scan images of 42 normal eyes using the UHR-SD-OCT device (Bi-μ, Kowa) and a conventional SR-SD-OCT (Spectralis, Heidelberg). To evaluate the clarity of the interdigitation zone subjectively, raters divided the integrity of IZ into three types by two raters. To evaluate the clarity of the IZ objectively, they calculated a peak height score at five different points of the macula using the longitudinal reflectivity profile. The mean (±SD) of the subjective visibility score of the IZ in the UHR-SD-OCT images was 2.64 ±0.54, which was significantly higher than the 2.46 ±0.46 in the SR-SD-OCT images (p=0.02). The peak height score was also significantly higher for the UHR-SD-OCT than for the SR-SD-OCT images at all five locations (all p<0.01). Investigators wrote that results indicated that the newly developed clinical UHR-SD-OCT instrument using the A-scan matching algorithm could obtain clearer images of the IZ, suggesting the device should be clinically useful in detecting finer structural abnormalities of the outer retina. Source: Matsui Y, Kondo M, Uchiyama E, et al. New clinical ultrahigh-resolution SD-OCT using A-scan matching algorithm. Graefes Arch Clin Exp Ophthalmol 2018; Nov. 7. [Epub ahead of print]. Adverum Biotechnologies announced that the first patient was dosed in the OPTIC phase I trial evaluating ADVM-022 for patients with wet age-related macular degeneration. At least six retinal centers across the United States are expected to participate in the trial. Adverum’s gene therapy candidate, ADVM-022, uses a proprietary vector capsid (AAV.7m8) carrying an aflibercept coding sequence under the control of a proprietary expression cassette and is administered as a single intravitreal administration. ADVM-022 is designed to provide potentially sustained therapeutic levels of aflibercept and to minimize the burden of frequent anti-VEGF injections. Read more. Acucela announced that it enrolled the first patient in a study to evaluate lead drug candidate emixustat hydrochloride in subjects with macular atrophy secondary to Stargardt’s disease. The FDA granted orphan drug designation to emixustat for the treatment of Stargardt’s. Read more. Ocular Therapeutix received FDA clearance for Dextenza (dexamethasone ophthalmic insert) 0.4 mg for intracanalicular use for the treatment of ocular pain following ophthalmic surgery; it’s the first FDA-approved intracanalicular insert delivering dexamethasone to treat post-surgical ocular pain for up to 30 days with a single administration. The approval was based on the following: demonstrated safety and efficacy in two randomized, vehicle-controlled Phase III studies in which a statistically significantly higher incidence of subjects were pain free at day eight post-cataract surgery compared with vehicle controls; and positive results in a randomized, vehicle-controlled Phase II study. Read more. The FDA cleared ProQR Therapeutics’ Investigational New Drug application for QR-421a, a first-in-class investigational RNA-based oligonucleotide designed to address the underlying cause of vision loss associated with Usher syndrome type 2 and non-syndromic retinitis pigmentosa due to mutations in exon 13 of the USH2A gene. ProQR plans to start enrolling patients in a Phase I/II trial, STELLAR, with preliminary data expected in mid-2019. Read more. Alimera Sciences announced that Health Canada has approved Iluvien for the treatment of diabetic macular edema. 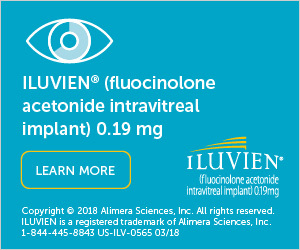 A fluocinolone acetonide sustained-release intravitreal implant, Iluvien is approved in the United States to treat DME in patients previously treated with a course of corticosteroids who didn’t have a clinically significant increase in intraocular pressure. Knight Therapeutics, which signed an exclusive Canadian agreement for Iluvien with Alimera in July 2015, will work with public and private payors to seek reimbursement for the implant. Read more. Genentech announced that the FDA approved ACTPen 162 mg/0.9 mL, a single-dose prefilled autoinjector for Actemra (tocilizumab) as an additional formulation for adult patients with giant cell arteritis and adult patients with moderate to severe active rheumatoid arthritis who have had an inadequate response to one or more disease-modifying anti-rheumatic drugs. Read more. Prevent Blindness, a volunteer eye health and safety organization, has established the Center for Vision and Population Health as a national coordinating body for effective practices, state-level technical assistance and program interventions. The CVPH will work through diverse professional stakeholders and patient advocacy groups to drive improvements in policies and programs, and promote a coordinated national approach to eye health. A 2016 report from the National Academies of Sciences, Engineering and Medicine titled “Making Eye Health a Population Health Imperative: Vision for Tomorrow,” advanced a number of recommendations for improving eye health in the United States. One of the suggestions was the need for a coordinated national effort that engages key stakeholders to advance vision and eye health from a population health perspective, which Prevent Blindness hopes to achieve with the CVPH. Read more. Notal Vision announced the FDA designated the Notal Vision home-based optical coherence tomography system as a “Breakthrough Device.” This designation indicates that FDA intends to provide interactive and timely communication with the sponsor, Notal, during device development and throughout the device’s review process for various types of premarket submissions on its quest for approval. The lightweight device is designed for operation by age-related macular degeneration patients from home. Once a patient completes the test, a proprietary machine-learning algorithm in the Notal OCT Analyzer prepares an automated analysis. If retina fluid is detected, a report is sent to the treating physician by the Notal Vision Diagnostic Clinic. Read more. Bausch + Lomb entered into an exclusive agreement with Modulight, a designer and manufacturer of lasers and optics for personalized medicine, to develop a new laser designed for use with Bausch + Lomb’s Visudyne (verteporfin for injection) photodynamic therapy. Visudyne is an injectable photosensitizer drug indicated for the treatment of patients with predominantly classic subfoveal choroidal neovascularization due to age-related macular degeneration, pathologic myopia or presumed ocular histoplasmosis. Activated through use of a photodynamic laser via direct laser excitation, it delivers a targeted approach aimed at destroying abnormal choroidal blood vessels, preventing further disease progression and helping patients maintain vision. Read more. EyePoint Pharmaceuticals announced that the Centers for Medicare and Medicaid Services has assigned a specific and permanent reimbursement J-code through the Healthcare Common Procedure Coding System for the company’s drug Dexycu (dexamethasone intraocular suspension) 9%. Dexycu is a single dose, sustained-release, intracameral steroid indicated for the treatment of postoperative inflammation. The company expects to launch the drug in the first half of 2019. The code, J1095, will become effective on January 1, 2019, and will replace the previously issued C-code for Dexycu (C9034) that became effective on October 1, 2018. The Company still retains transitional pass-through status for Dexycu from CMS for approximately three years. Read more. Alcon is launching the Alcon Retina Fellows Institute, an educational offering supporting retina fellows during a weekend-long training at the Alcon Experience Center in Fort Worth, Texas. The program, led by a group of world-class faculty, features the latest innovations in retina surgery, and offers hands-on training for key procedures in a surgical laboratory setting. The Institute will be an annual event in which attendees will have the opportunity to visit the Alcon Experience Center in Fort Worth, which Alcon describes as a state-of-the-art facility providing eye-care professionals with comprehensive eye-health education, experiential learning opportunities and virtual reality technology for an immersive training experience. Read more.